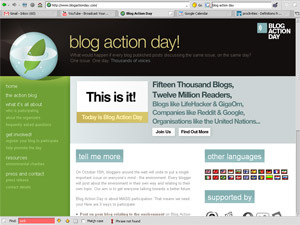 So, I volunteered to write a post today on the environment as part of Blog Action Day, which has organized thousands of bloggers to write about that single topic on this day, October 15. A cool idea and, obviously, a worthy cause. As per the web site’s instructions, I’m charged to write a post about how I relate to environmental issues (that whole ball of wax) in my own way. As such. . . Under that guise, here are a few small and simple ways I try and make a difference, and hopefully, an impact. . .
For years I’ve employed two wheels, a chain and pedals to move myself around town in lieu of pistons and gasoline. I live in the city in Minneapolis and ride year-round, scorching summer days to minus-20-degree snot freezers. I’m not a bike Nazi. My wife and I own two cars (we just got our second after years with one). I drive when I need to. But I bike always when I can. We keep our windows open in the summer. We use fans. We use air conditioning maybe six times a summer. In winter, we keep the heat low, wearing sweaters, slippers and sometimes cozy stocking hats indoors. This saves energy and money on our monthly utility bills. I was a vegetarian for years. That’s a subject of its own I won’t go into here. (See this story for my thoughts and ruminations on hunting, meat and vegetarianism: http://travel.nytimes.com/2006/11/10/travel/escapes/10deer.html). Now I eat meat in moderation. I avoid fast food. We try to buy quality, local and organic. I treat the subject with respect. Try not to take animal flesh for granted. The more you’re outdoors and feeling small under mountain peaks or ink black starry skies, the more you appreciate nature and your (minuscule) place in all of THIS. The effect is a natural tendency toward environmental concern/care. If more people were outside, in the woods, in the backcountry, more often, I believe there’d be better commonality on the topic of preservation and all good things that flow from that. O.K., that’ll do ‘er. No more preaching today. Hope some of these points seem logical. It’s the small stuff like this, I believe, that when acted upon by many can make a big difference.